Samuel Prescott joined Paul Revere and William Dawes on their famous &ldqu;Midnight Ride”. They encountered a British patrol and Revere and Dawes were captured. 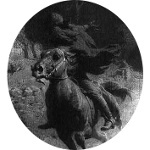 Samuel Prescott escaped capture and was the only rider to reach Concord. 1 Roberts, Gary Boyd, The Royal Descents of 600 Immigrants to the American Colonies or the United States , Baltimore: Genealogical Publishing Co. (2008), 419. 2 Wikipedia, "Samuel Prescott", (accessed 03/14/2013).